The West End Civic Association (WECA) Planning and Zoning Committee convened a meeting on the evening of August 28, 2014 to hear about a proposed redevelopment of the Hartford College for Women site. The property, bounded by Asylum Avenue, Elizabeth Street, and Girard Avenue, is a little over 10 acres and is currently owned by the University of Hartford. It has been available for a number of years, and has been the subject of a previous proposal. The development team currently interested in the site was represented by Dwight Merriam and Garrett Heher. Mr. Merriam is a Partner at Robinson+Cole in Hartford, and specializes in real estate, development, and land use. Mr. Heher is the Principle at Mercer Realty Partners in Centerbrook (Essex), and is experienced in development, construction management, and architecture. Mr. Merriam appears to be the driving force behind the project, and has partnered with Mr. Heher to bring complementary expertise. The Dean of the University of Connecticut Law School, Timothy Fisher, also sat on the dais during the meeting. However, he made it clear that although the school is supportive of the proposal, there is no formal relationship between UConn Law and the developers/project. 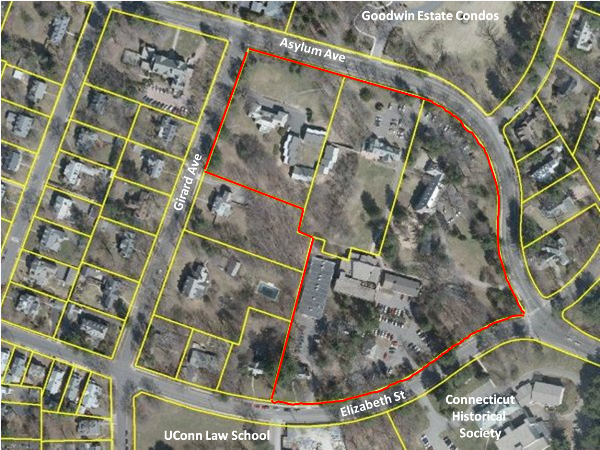 Messrs Merriam and Heher imagine the southern portion of the site, along Elizabeth Street, as an opportunity to add apartments, primarily to serve the UConn Law campus across the street. A survey of Law School students found that only 25% to 30% of respondents live within one mile of campus. The survey also found that many students live three or more miles away, and rent larger units than they need or want because of the rental housing stock. Faculty advisors reported difficulties in transitioning international students into the community, with the lack of traditional student housing exacerbating culture shock. The current iteration of the development plan calls for 225 apartments. The units would be approximately 75% studios, 25% 1 bedrooms, and a few 2 bedrooms. Price points would need to be in the range of $800+ per bed, per month, in order for the financials to work. The exact mix of units is still to be determined, as the student survey also found that about 35% of respondents were interested in having a roommate, which suggests adding more 2 bedroom units and reducing the number of studios. Mr. Merriam expressed confidence that they would be able to legally restrict occupancy to certain types of tenants, specifically giving preference to graduate students. Law School students would be offered the units first. He said he would consider reaching out to St. Francis Hospital and other local graduate student populations to find additional students. Mr. Merriam and Mr. Fisher were both emphatic that they were not interested in bringing in undergraduate students as tenants. He did note that in order to be able to secure funding, the developer would need to have the right to fill vacancies with tenants from the general public if the demand from the targeted post-graduate population did not fully lease the buildings. All of the mid-1900s buildings currently on the site would be removed. Those structures would be replaced with new construction apartment buildings containing about half the rental units. An additional new construction apartment building would be erected along Elizabeth Street that contained the other half of the units. Both of the newer buildings would be designed to match the architectural character of the surrounding community, and would be high efficiency buildings. Mr. Heher mentioned LEED Platinum certification, but did not commit to that level of efficiency for this project. There is still a meaningful amount of uncertainty about what would happen to the historic mansions on the northern portion of the site, along Asylum Avenue. The developers’ current thinking is that the best alternative is to secure the exteriors of the Babcock and Johnson buildings with repairs to roofs, trim, and paint, and then take them to market as single-family homes. This would likely require the existing Townhouses to be removed in order to make the Babcock building desirable to a single-family home buyer. There was no mention of the historic carriage house near Elizabeth Street, and that structure was not shown on the draft site plans that were distributed. There is also not a firm parking plan to accommodate the new tenants, as selling off two of the mansions would eliminate parking on that side of the site. Dean Fisher expressed interest in the largest of the three mansions, Butterworth Hall, as a conference and retreat center for the Law School. There has also been some discussion between the developers and the Law School about the historic building at 50 Elizabeth Street. Both the developers and the Dean emphasized that the discussions were very preliminary, and no decisions have been made. On the environmental front, the site contains wetlands and modest soil contamination. The wetlands were determined to be a small area that has been “greatly degraded,” and therefore no special actions would be taken other than to secure what remains. The soil contamination was described as “typical of an urban site,” and also not a major concern or, apparently, a major expense. At the practical level, the developers are working on multiple fronts at once. They are adamant that the project will not go forward without support from the West End community. The WECA Planning & Zoning meeting was their first step in reaching out to the full neighborhood, and they promised to return to the group as the project progressed. They had previously met with a group of immediate neighbors of the site to discuss their ideas. The project depends on relief from current zoning regulations. Mr. Merriam is an expert in Land Use law, and has proposed a two step process to get the project approved. First, he would amend the text of the City zoning laws to create an exception that would be written so that it could only apply to this project, and only to this site. Next, he would finalize the site plan to conform with the exception and bring the plan before the community for feedback and approval. Finally, the proposal would be submitted to the City to claim the zoning exception and receive final approval. The development team is currently working with the City’s Development Services office to get initial feedback on the project. They have also been in touch with the Assessor’s Office to discuss the tax implications of various legal structures. Mr. Merriam said that the property will be returned to the tax roles. They are currently considering structuring ownership as a condominium community, which would allow different uses for different buildings, and would provide favorable tax treatment for the residential units. They also plan to ask for a tax abatement from the City to improve the project’s cash flow in the early years. The final piece of the logistical puzzle is financing. At this point they have yet to secure funding, though are optimistic that the money side will work out. Mr. Merriam noted that there is little room to reduce the size of the apartment portion of the project without a major impact on the financials. About 40 people attended the meeting, and many asked questions. There seemed to be a wide range of feelings about the project. The developers were asked about the impact on existing West End landlords, the legality of focusing on law students, the zoning relief process, parking for the future tenants, plans for increased security and/or amenities, the tax contribution to the City, and the plan for the historic buildings, among other things. When asked how the project would benefit the West End, three points were made. 1. Resident law students will reduce the number of cars on the roads by reducing number of commuting students. 2. The design of the buildings will match the architecture of the neighborhood. 3. The new residential community will make that portion of the neighborhood more alive in the evening and morning, and will contribute additional shoppers to the Farmington Avenue business corridor. Messrs Merriam and Heher emphasized that the apartment project on the Hartford College for Women site would evolve in an iterative manner. They continue to work with the City, with the Law School, and with the capital markets to move the plan forward. They also assured the audience that they would be responsive to needs and concerns of the West End. The meeting laid out the thinking behind the proposal, and outlined the basic structure of the development. It is food for thought, and will lead to additional questions in the coming months. Is there a fear that the city will eventually crackdown the lodging of such students in illegal attic apartments that lead to the crazy density in the immediate neighborhood?